Cooking With Elise – Roasted Red Pepper Tomato Soup – to roast or not to roast? Roasted Red Pepper Tomato Soup – to roast or not to roast? 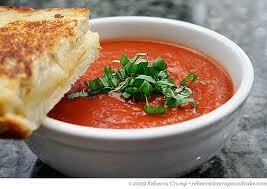 Home » Recipes » Soups & Salads » Roasted Red Pepper Tomato Soup – to roast or not to roast? With autumn finally here, I love making different kinds of soups. What’s your favorite fall-inspired soup? There’s just something comforting about a bowl of soup particularly tomato soup! Tomato soup can be served hot or cold, but in the fall and winter I love to serve this Roasted Red Pepper Tomato Soup hot especially with a grilled cheese sandwich! Roasting red bell peppers is super easy and tastes so much better than those found in jars covered in liquid. Jars of roasted peppers can also be very expensive as well. Considering the cost and most importantly the flavor and ease, roasting red bell peppers yourself just makes sense! Place your red bell peppers in a baking dish and then under your broiler. Using tongs, turn the peppers as the sides blacken. Once your peppers become charred on all sides, carefully remove them and place them in a brown paper bag. Close the bag up and let the peppers sit for about five minutes. Trapping the steam in the bag will make peeling the peppers so much easier. Once you can touch the peppers, begin removing the blackened skin to reveal a lovely roasted red bell pepper. Never place roasted peppers under water to remove the skin. If you do so, you will be washing all of the flavor away! Cut the peppers in half, remove the seeds and the chop. Set aside until you are ready to add to your soup. Warm the olive oil in a large heavy saucepan over medium heat. Add shallots and saute for about 8 to 10 minutes until soft and translucence. Add the chicken stock, red peppers, tomatoes, sugar, and basil. If you are not using a homemade stock, it is very important to choose a stock low in sodium. Bring to a boil, then reduce the heat, cover and simmer for about 15 minutes. Remove the tomatoes and peppers with a slotted spoon and transfer to a blender. Add a little of the liquid as well. You must be cautious when blending hot liquids in a blender. Do not completely close the lid of your blender. Use a towel over the top of the lid to eliminate any mess. Blend until smooth and return to pan. Season with salt and pepper. Ladle into soup bowls, serve with a pretty piece of basil or a chiffonade of basil. When in the mood, I place a little plain yogurt or creme fraiche in a plastic bag, cut a bit of the tip off and swirl a pretty white line on top of the soup. Enjoy!